On her way over to our house to watch playoff hockey, my sister stopped in at one of both her and my favourite wine shops where they happened to be having a small tasting of a few Greek and Austrian white wines. 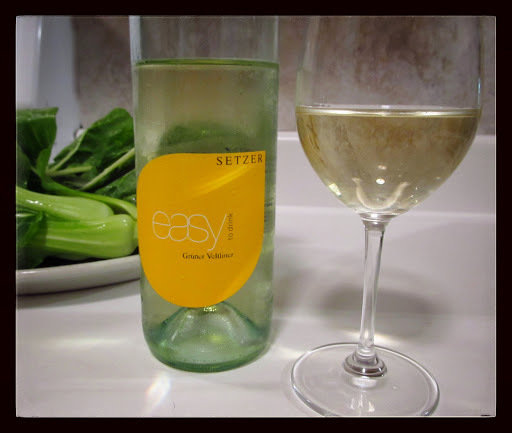 She sent a picture of the bottles they were tasting, and I asked her to pick up the Setzer ‘Easy to Drink’ Grüner Veltliner 2011, since it is one of my most loved white grapes and this particular bottle is a Terry Thiese Selection, whom I think is brilliant. The Setzer Winery was founded in 1705 and is one of the oldest continuously run estates in the Weinviertal region of northeastern lower Austria. Today the husband and wife team of Hans and Uli Setzer run the 15 hectare family estate. Their grapes are grown without the use of any chemicals or synthetics, and they practice sustainable, integrated and dry farming methods. The wines are fermented in stainless steel with ambient, natural yeast. The back label beckons with the statement “Easy to drink means: More Wine & Less Alcohol”. Pale gold in colour, aromas of peach, apricot and chalky minerals rose from the glass. Pear and honey flavours were accompanied by bright acidity and hints of creamy red lentil in the light body. Smooth stone minerals and traces of white peppercorn comprised the crisp finish. Polished and easy drinking [furthered by its very modest alcohol content], this is a mellow and refreshing glass fantastic with light, summery dishes.